Scared of flying? Tips to help cope with a fear of flying. For some parents, it’s not so much a fear of flying with their child, but their own flying phobia which makes the thought of a family holiday abroad a very daunting prospect. As ex cabin crew, I’ve met a few petrified passengers, who have astounded me with their bravery for flying long haul when it is their absolute worst fear. You certainly wouldn’t get me in a ‘I’m a celebrity’ style tank of spiders for 7 hours… Pre 9/11 you go could up to the flight deck when cruising, which often helped reassure nervous passengers to a certain point. The feeling of being out of control would somewhat subside after seeing two capable and calm pilots along with all the technical equipment working as it should. These days, you may be fortunate enough to glimpse the flight deck as you board, but there is no guarantee they will let you in to have a reassuring chat. This time, it was more personal, as we decided to go on holiday with friends and their two year old. One of the reasons was to help my friend with her fear of flying, and to try and take some of the pressure off her. She was adamant that she didn’t want her fear to project onto her daughter. We’ve flown together before – a short girlie trip to Madrid, so I’ve witnessed the build up of fear before the flight and the terror she feels over turbulence. Here is the experience followed by her top tips to help deal with a fear of flying. Top Tips If You Are A Nervous Flyer – By my friend who is! Once we booked our flight, we chose our seats online, as that reassured her knowing we were all sat together. On this occasion we needed to pay a little extra to do so, but it took away one concern. At the airport, we arrived in plenty of time to join the queues at bag drop, security and passport control. All baby and toddler drinks were in toddler or baby bottles, and any other liquids below 100ml were placed in clear plastic bags to avoid any unnecessary delays. Once through security, we did have an hour or so before the flight departed, so as a small group, we found a ‘base’ in a cafe. From here we dispensed the children with nibbles, drinks and last minute nappy changes. My friend and I also killed some time with a little retail therapy. From my perspective, keeping her mind occupied and basically active seemed to help – whereas waiting around just made her more nervous. Usually, I would board a little later with children, as I find it just means they are waiting for everyone else to board, which can make them more fidgety. However, boarding first, rather than waiting in a long queue seemed to help the process slightly for my friend. My friend had taken some medication prescribed by her doctor, but she was still feeling anxious. Luckily, her daughter provided some much needed distraction. The plane was a novelty for her and the excitement with flying with her buddy also helped. 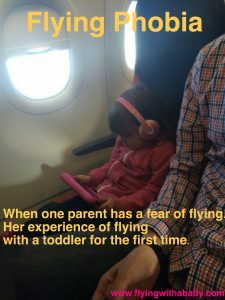 (For ideas of toys and games for toddlers read the tips on this post) Both sectors went favourably until the closing stages of the flight and you could clearly see how she was trying to hide her fear from her daughter – which she did incredibly well. Unfortunately, the weather was a little grey and dismal, meaning there were a few anticipated bumps towards the end of the flight and during descent. This clearly panicked my friend and she couldn’t help but let tears flow as she gripped on fast in brace position to the seat in front of her. However, the crew were brilliant and stopped to chat and reassure as they carried on their normal duties, we also chatted- anything to basically take her mind off of it for a minute or two. Her daughter was none the wiser and thought her Mummy had a tummy ache. Sit in the middle of the plane, near the wings. This is the smoothest place. Keep busy- I’m the organised type, but looking after the passports and boarding passes, where the gate is, getting the currency etc helps distract. It’s ok to be afraid- logically I know and understand how the aircraft works and how safe they are ( and I’m married to an RAF engineering officer) but sometimes it’s hard to crack- even skydiving hadn’t cured me yet- but I accept it now and don’t beat myself up about it- most people have fears of some kind. Don’t be afraid to take something if it helps – this time I took a tablet but a little booze has helped before travelling with kids I thought a tablet was the better option this time! Ask about the flight- the crew generally know if it’s going to be a bumpy one- being prepared for turbulence helps! Little white lies are ok- I would rather my daughter thought I had a tummy ache than was scared. I want her to explore the world like I have- maybe without spending a record 13 hours in the brace position!